Pardew pooh-poohs Gutierrez's talk of lazy training sessions | NUFC Blog. “We didn’t purchase enough players in the summer to carry us through two programmes. We took injuries on board when those two competitions were running parallel and that impacted on us massively when we were moving towards Christmas and then we got ourselves into a bad situation. “I also think that the Thursday-Sunday scenario took away from a lot of the good work we were doing on the training ground because we didn’t have enough time to recover. “If we had a bigger group last year maybe we would have had a bit more intensity in the group that were training – maybe 10 (training) rather than four. You know, if there’s one thing I’ve learned from being in the Army, it’s never ignore a poo-poo. I knew a major, got poo-pooed… made the mistake of ignoring the poo-poo. Fatal error! …because it turned out all along that the soldier who’d poo-pooed him had been poo-pooing a lot of other officers… who poo-pooed their poo-poos. In the end, we had to disband the regiment, morale totally destroyed… by poo-poo! So, let’s see. On one hand, we have a player who wants to train hard and is saying “we didn’t train hard enough”. On the other hand, we have the person who reportedly let things go through easily, and who’s well known for those rose tinted glasses he viewed the problems through. Who to believe? Well at least he is consistent, Is wor Alan. His interviews are basically the same, He starts off by holding his hands up, Saying him and his staff have made mistakes. Then with each passing sentence, He proceeds to extricate himself from any wrong doing, Until eventually everyone gets the blame, Apart from his good self. Was that because I used the word p o o ? Gomis and Reny in the naughty boy club. Taking ages for Rems to sign now. “Poo” or “Pooh” isn’t banned on here, Count. What then? Am I on probation or something like? No, it was just one of those things, Count. I’ll see if I can find out what caused it when I get some time later. Righto. Just wondered. Nee botha. 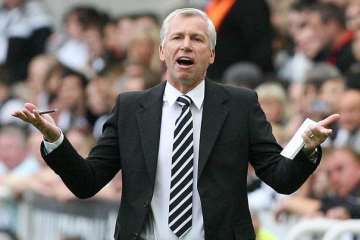 Count, it’s Pardew who’s on probation. Quite. I have a feeling this season will be much better than last, so I can’t see him leaving. Hey-ho. I must compliment you on this blog, It is head and shoulders above the rest. Hey-maybe somebody can point out to this dbag that our performances in the league after Thursdays in Europe were actually better than average for last season. What a douche. That’s the Metro, Pete. They can’t seem to get it together at the moment to get the major aggregators like “Newsnow” to pick up any of their Premier League bloggers (like myself) since they moved the blogger’s part of the site. I could sort it out in five minutes if it was this blog and I’m nobody special. On the other hand, they are part of one of the biggest media organisations in the country (the Daily Mail group), and should have the likes of Newsnow bending over backwards for them. It’s crazy. He clearly explains that the training WAS too easy, and that was down to the recovery time necessary following two games a week. If you are including time for post-game recovery, your training sessions will simply not be as intense. Keep up your criticism of the local papers and their lazy journalism though! You have a point, it is a bit misleading and I’ve changed it. As I’ve already pointed in in this piece several month ago though, recovery or anthing else for that matter didn’t affect Fulham, Stoke, or even Birmingham City that much, even when the last of those clubs was having it’s squad ripped apart after relegation and the owner being up on money laundering charges. Hughton refused to use it as an excuse for Birmingham narrowly missing out on promotion because he isn’t a coward and has balls. @ 19: Wow. That’s some pedantry. The point is the same. Gutierrez says part of the problem is that training lacked intensity; AP has an excuse for that. As with everything. So, it’s official then. Remy’s appeared with the shirt and JFK. Oh goody. We now have Remy and his understudy – didn’t we sign Gouffran only after Remy had knocked us back? No clue, but they are both pacy and can score so I am happy. Nothing about being able to buy him outright after the loan though. Count, what makes Worky’s blog the best blog is that you can poo-poo all you want – and several of us do poo-poo – but it is interspersed with humor, distraction, intelligence and cutting-edge insight. Some blogs relish being the first post, but rarely do they claim that spot and include such excellent content as you have managed to do at the same time. Bravo! P.S. I should have said “what makes Worky’s blog just the ticket”. Kinnear looks on his last legs in that photo! Remy in on loan. Well, I won’t be getting his shirt but here’s hoping he does the business. Not buying lines about being honored to play here, blah-di-blah…yeah, yeah, yeah-get on the field and get some goals. It could be though that the West Germans were as drugged up to the eyeballs as their East German counterparts. Allegedly it was in many sports, was systematic and even sponsored by the government. There are also reports that three members of the 1966 world cup team tested positive for ephedrine like Maradona. It could possibly grow into worst sports scandal ever. Subs: Elliot, M’Bia, Gutierrez, Gouffran, Shola, Marv/Anita. Aren’t we preparing a “daring swoop” for Thomas Ince any more then, Phisix? And wouldn’t Downing’s wages be a bit too steep for greedy Mike? Blog?silly boy sit down and finish your jelly. Nice to see that he values the opinion of his players so highly. And, once again, he trots out the cobblers about the Europa League campaign being to blame for last season’s implosion in the Premiership. I suppose our less-than-ambitious efforts in the transfer market are nothing less than a cunning plan to ensure that we don’t have to go through one of those dreadful European competitions any time soon.